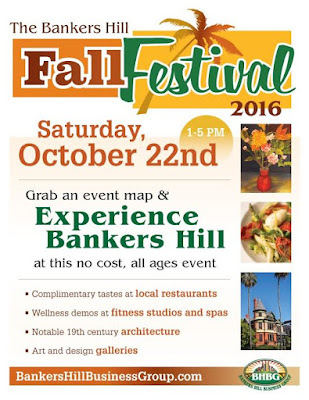 The historic community of Bankers Hill is inviting all to celebrate local businesses and the change of the season with the first annual Bankers Hill Fall Festival on Saturday, October 22, from 1 to 5pm. Designed to showcase Bankers Hill as a destination neighborhood following notable growth in recent years, the Bankers Hill Fall Festival is a free-to-attend, walk-around event similar to “Tastes” and “Walkabouts” taking place in other neighborhoods. Beginning at 1pm, attendees can visit either the North pick-up location (Royal Stone Bistro at 1st Avenue and Upas Street) or South pick-up location (5th Avenue and Kalmia Street) for a complimentary map exhibiting a trail of participating businesses along ten blocks of Fifth Avenue. More than twenty restaurants, fitness studios, med spas and more will showcase their fare and wares inside their doors and upon sidewalks as streets remain open to traffic and offer plentiful parking. Shuttle service along Fifth Avenue will also be provided at no cost. Attendees will be able to taste the flavors of newly opened eateries such as Parc Bistro-Brasserie (also celebrating its Grand Opening this day), Royal Stone Bistro and Back to Roots Market, as well as long-time favorites Barrio Star, Pizzicato, Jimmy Carter’s Mexican Cafe and more. Wellness centers including Club Pilates, Float Sanctuary, Orangetheory Fitness, AcruHealth, B Medical Spa, Healthy Foundations and Herbin Acupuncture will open their doors to health-minded demos, while additional participants such as Pilar Montano Paintings, Plush Salon, North Island Credit Union and Edward Jones Investments will show off all that Bankers Hill has to offer. "Bankers Hill has grown tremendously in the fifteen years that I’ve lived and work here, and a lot of us believe this neighborhood is the hidden gem of San Diego," said Jake Sutton, co-founder of the Bankers Hill Business Group. "Our organization’s goal is to let San Diego in on this secret. Bankers Hill is home to many favorite restaurants, a booming wellness industry, several artists’ galleries, boutiques, salons and more. We hope San Diegans will join us this October to experience everything Bankers Hill has to offer." Bankers Hill, also referred to as Park West, is located immediately north of Downtown San Diego and west of Balboa Park and earned its name by being home to San Diego’s earliest affluent residents. In recent years it has seen an increase in residential complexes as well as commercial growth in the form of new restaurants, boutiques, wellness establishments and more. Bankers Hill also boasts architecturally notable houses from the late 19th century, sweeping views of San Diego Bay and two of San Diego’s historic pedestrian bridges - the swinging Spruce Street Suspension Bridge and the Quince Street Bridge, crossing high over the Maple Canyon Open Space Trail. 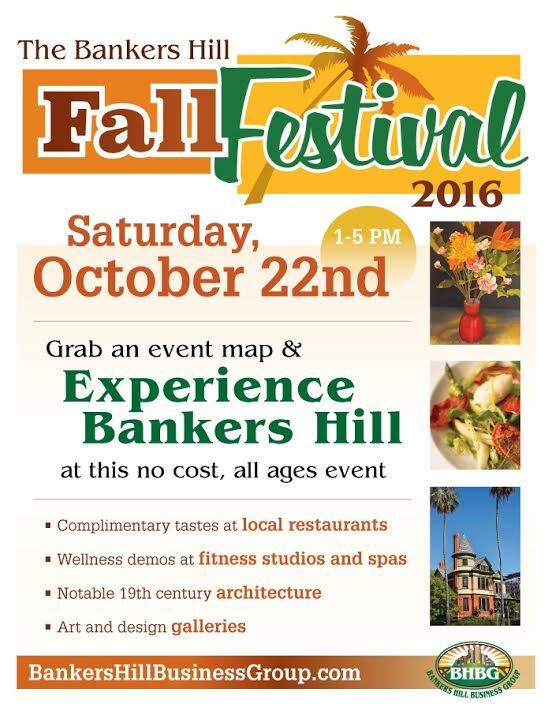 The Bankers Hill Fall Festival is a free, all ages event. For more information, visit bankershillbusinessgroup.com.